It seems a little silly to call this a quiet book, since the central event is a storm that lasts four days, but quiet it is. In it, the reader learns a lot about what it takes to survive such a storm and how beneficial it is to be helpful to those around us. As Noah’s family readies for a big storm, Noah worries about the small creatures he regularly meets in his backyard. As his father boards up the windows, Noah prepares his wagon for the salamanders, field mice, hummingbirds, and spiders to take shelter. He removes the wheels and adds a roof and walls. As his mother and sister stack groceries in the kitchen, Noah gathers seeds and other foods for the animals. With the yard flooded, the animals are indeed safe inside Noah’s ark. As always, Rocco’s beautiful illustrations are important part of the story. Imagine living through such a big storm and being in the ark. 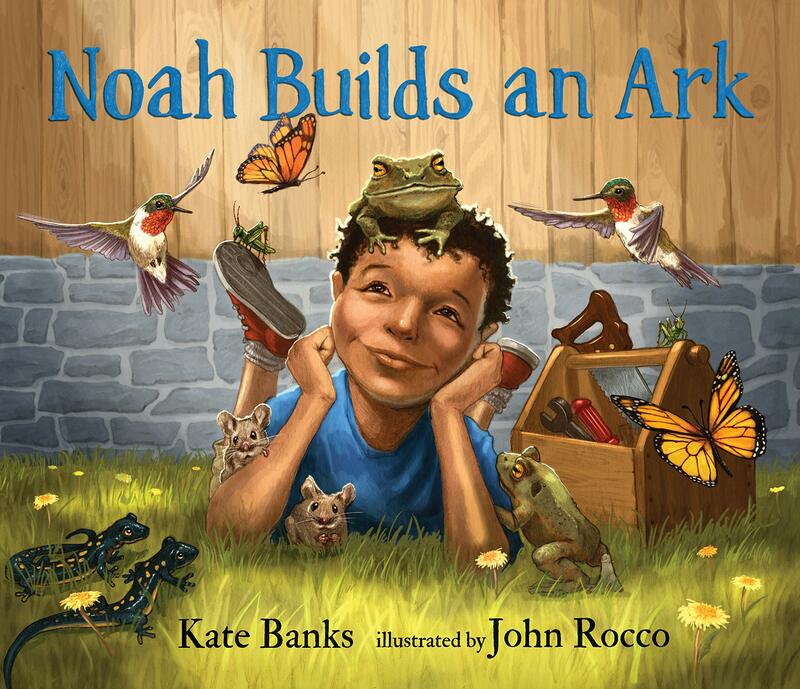 Though it’s somewhat doubtful that all of Noah’s creatures would share this type of space, the heartwarming way in which the story is presented make this a tale worth embracing. It makes the reader wonder how they can help others, especially those animals mentioned. Kayla really needs to learn to speak – or at least understand – dog-lish. Because King often has all the answers for solving the mysteries they confront. In the latest installment of the King and Kayla series, they are trying to figure out where a stray dog came from. Kayla quickly realizes he is not a stray because he knows tricks. 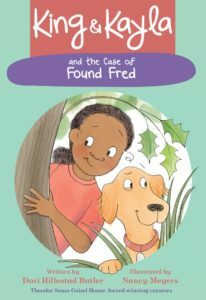 King gets his name – Fred – and clues to his family’s location. Not until King has a chance to show Kayla the answer is Fred reunited with his family. Kayla’s well thought out approach to problem solving is an excellent model for readers to learn. She always lists what they know and what they need to discover to solve the mystery. Plus, she has fun while she helps the lost dog. Outstanding illustrations accompany every page, helping to draw the reader into the story. They can truly feel the fun to be had a vacation lake. This cute rhyming story follows a baby robin as it shakily learns to fly like mama. Not only are those first “steps” difficult, but the presence of a cat makes concentration especially challenging. Of course, it’s a rocky start, but the bird soon finds that the effort to try new things can be well worth it. Wonderful illustrations make for a thoroughly enjoyable experience for readers. They can feel the baby bird’s struggle, the pride of the mother bird, the possible amusement of the sparrows as they watch, the malevolence of the cat, and more. The bird even watches while sister does ballet moves. In addition to the lesson to keep trying, readers will learn a lot about birds – American robins in particular and what makes a bird in general. They will also learn about predators and the circle of life. As is usual for this publisher, extensive suggestions for further learning accompany the text, with links for even more learning. STEM is not just an acronym. Title: Why Should I Walk? I Can Fly! Do you ever wonder why we celebrate Black History Month? The contributions of African Americans and other groups have often been ignored or even actively covered up. So, if you really want to learn about history, highlighting this group becomes important. Carter G. Woodson, who eventually earned a doctorate in history, was an outspoken advocate for black history. He happened to be black himself and first had to fight for the right to read that history. In his pursuit of his heritage, he became part of that heritage. His childhood was a fascinating struggle for learning. In this beautiful new book, the author and illustrator reveal that struggle and encourage the reader to become part of the struggle too. Carter, born ten years after the end of the Civil War, was the youngest of seven children of parents born into slavery. Carter was only able to attend school when he wasn’t needed on the farm. But his father encouraged his learning by asking Carter to read the newspaper to him. As a teenager, Carter worked in a coal mine to help feed the family. His co-workers also asked Carter to read the newspaper aloud, sparking him finish high school and move on to college. 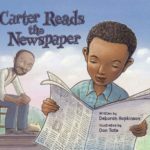 The author has the reader cheering for Carter at every turn, and the illustrator makes his life and those of parents come alive. The reader also gets a glimpse of many figures from black history throughout the book and in the end papers, hopefully generating more curiosity from the reader. Friends aren’t that easy to come by, especially when you’re shy and new in the neighborhood. Sometimes, it’s easier to hide inside your house, even if the walls are white and boring. But the white walls could be hiding a good new friend, like a white lion. Once you find that lion, it could probably play with you – climbing, racing, and playing hide-and-seek. At her mother’s and the lion’s urging, little Caro finally talks to a boy named Bobby. She finds out Bobby was not only fun, but he had other friends who could be hers. Mum invites the friends over, they paint the walls so that the lion disappears. But she finds she can still remember the lion and play with him occasionally. Who can’t relate to being a bit reluctant to talk to someone you don’t know? Often, they’re not really so frightening after all. Often, they could end up being your best friend. And who won’t enjoy the beautiful illustrations that show how easily the lion can hide and how much he loves Caro? 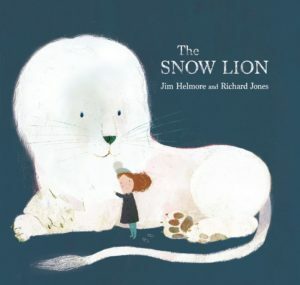 This quiet story is best as a bedtime read aloud, when kids can hunt for the lion in the white walls and be satisfied that Caro will be okay. In the Explore More sections, the author includes fun games for reinforcing what has been learned and for interaction with adults plus more facts about the animals featured. A chart even shows the many animals for which the same baby name is used. Even kitten has seven animals listed other than cat. 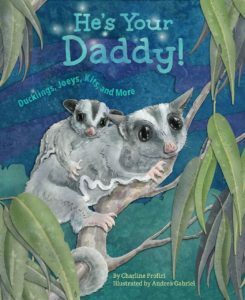 The best use for this cute book is as a read aloud, either at home or in a classroom, so adults can guide readers toward as much learning as possible and discuss what daddys mean to the readers. 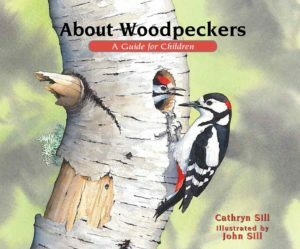 Twelve species of woodpeckers, among the more than 200 known species, are highlighted in this very informative new book. The beautifully detailed illustrations are part of the educational theme. Beyond what the reader can learn by careful study of the paintings, they also learn a lot by what the author points out with each illustration and in the afterword. Woodpeckers are pretty much built for what they do. They have strong, sharp bills and powerful necks and thick skulls. They have small feathers over their nostrils to filter out sawdust. Woodpeckers even communicate with their drumming. Most woodpeckers live amongst trees, but some live with cactus and bamboo to drill. They have strong feet and sharp claws plus stiff tail feathers to help hold them up on the sides of trees. Though they can be destructive, they help out by giving other animals holes to live in and by keeping destructive insects under control. 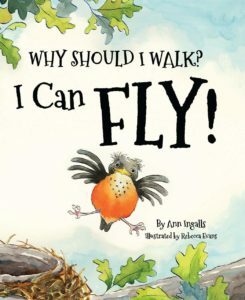 This is an important resource for kids learning about birds and about the environment we all live in. It’s simple and yet complete. It would be a great beginning point for more study. In her debut picture book, Rowe introduces us to a word collector. Ebenezer collected words the way some people collected stamps. He wrote them in his Word Book. He also loves letters, because they make up words, after all – junction, juggle, and jukebox. One day he meets Fitzgerald, who has ideas but not words to convey them. They write great stories together. The illustrations are fun and demonstrate the words and how they are made. The story shows how we sometimes need to collaborate with others who have different talents in order to achieve something worthwhile. 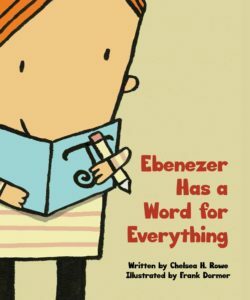 Hopefully, the fascinating words Ebenezer collects will also show the reader how wonderful words are and spark their own love of words. How can you resist a swashbuckler that says blimey. Few figures of the abolition movement have gotten the recognition of Harriet Tubman. That’s not to say there weren’t many, many more deserving souls involved in emancipation. What sets Harriet apart is just how accomplished and tireless she was. This gorgeous picture book highlights her many achievements and makes her life more real for the reader. Cleverly, the author shows that Harriet didn’t just become an old woman. She had many stops along the journey. Before she was Harriet, she was literally known by other names, but she could also be identified by her roles. Suffragist, generally, spy, nurse, Aunt Harriet, Moses, conductor, Minty, and Araminta. The author highlights each role and draws the reader into Harriet’s world. She lets them know what life was like for this wonderful woman. The lyrical approach helps attract the reader to that world, as do the amazing illustrations. 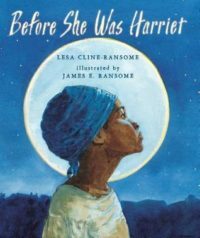 Seeing Harriet in the dark with the houses in the distance lets the reader know what a risk she was taking with the Underground Railroad. Seeing the suffragists intent on her words lets us know the respect she commanded. Very important addition to the Harriet Tubman library. 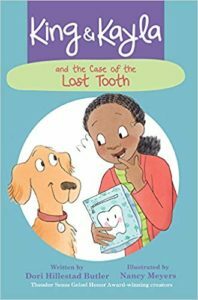 Fourth in the mystery series, The Lost Tooth is well worth a look for kids learning to solve problems while they learn to read better. Kayla is a strong believer in scientific method, carefully listing the clues that she and King have and the things they need to know. King also thinks he knows some clues, but he is mostly available for amusement. When Kayla loses a tooth at school, her teacher sends her home with the class tooth fairy pillow. By the time she gets home, she is unable to find the tooth. King keeps smelling evidence of Kayla’s mouth but must hunt for the tooth along with Kayla. Of course, it’s King who eventually finds the tooth, but not without some destruction along the way. The simple language, quick action, and familiar situations of this series make it a great introduction to chapter books. The illustrations give hints about the story that might help the struggling reader. Plus, the illustrations are pleasing and add to the enjoyment.